As the responsibility for technology investments moves away from IT and into business units, we’re seeing an explosion in the market for SaaS apps. Quick, powerful and cost-effective, SaaS apps allow companies to dial in exactly the functionality they need, without heavy investments in infrastructure or lengthy implementation cycles. Microsoft AppSource launched in July as a destination to serve this demand, connecting our worldwide ecosystem of ISV partners directly with business users. Today we are furthering our commitment to help customers reduce the time and complexity of implementing line of business (LoB) SaaS apps by extending the AppSource ecosystem to include the expertise and services of SI partners. AppSource has grown to nearly 250 apps in the first 90 days with hundreds more in the pipeline. 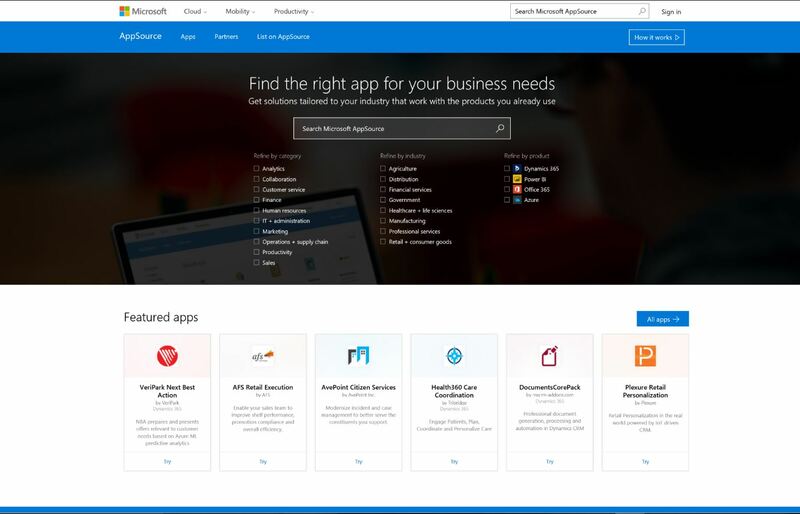 Business users who need modern apps can find and try them from a single location – apps spanning Dynamics 365, Power BI, Office and others. And with today’s announcement, more than 100 SIs anchored on apps in AppSource have already been onboarded and are now accessible. These SIs are ready to support businesses on their journey from discovery to trial and implementation. Customers interested in an app will instantly get focused recommendations to find the right SI partner with relevant experience based on the unique requirements of the app, industry expertise, geographic location and other factors. Click on a specific SI, and you’ll get an overview of the SI partner, including competency information provided by our Microsoft Partner Network database. Whether you’re an ISV with a great app to deliver or an SI with skills customers need, your first stop should be AppSource. Partners interested in listing an app can learn more about the submission criteria and process here. To be included as a service provider, SIs must be listed on Microsoft Partner Center and be sponsored by an ISV whose app is already listed on AppSource. In this way, we’re ensuring a strong connection between the ISVs who build the apps and the SIs who implement them. More information about the process can be found here. With the addition of SIs, we’re sharpening the vision we had for AppSource from the beginning. Today AppSource is a premier destination where businesses can discover and trial new technologies that help them do more. It’s a place for ISVs to connect with qualified customers. And now it’s also a place where SIs can accelerate solution delivery and help get new implementations up to speed quickly. In the coming months, we’ll be rolling out even more capabilities and publishing dozens of new apps from our submission pipeline. So make sure and check back with AppSource often as we continue to make it the best destination for LoB SaaS apps. Simply put, AppSource is working exactly as we hoped it would— and we’re just getting started.